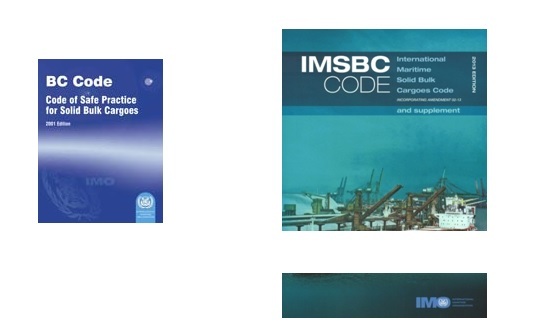 What is IMSBC or International Maritime Solid Bulk Cargoes Code & What are its contents? The primary aim of the International Maritime Solid Bulk Cargoes Code (IMSBC Code), which replaces the Code of Safe Practice for Solid Bulk Cargoes (BC Code), is to facilitate the safe stowage and shipment of solid bulk cargoes by providing information on the dangers associated with the shipment of certain types of solid bulk cargoes and instructions on the procedures to be adopted when the shipment of solid bulk cargoes is contemplated. IMSBC Code is supplemented by the Code of Practice for the Safe Loading and Unloading of Bulk Carriers (BLU Code including BLU Manual) & recommendation on the safe use of pesticides in ships applicable to the fumigation of cargo holds. It also includes a directory of contact names and addresses of offices of designated national competent authorities responsible for the safe carriage of grain and solid bulk cargoes. IMSBC Code and supplement is commended to Administrations, ship owners, shippers and masters and all others concerned with the standards to be applied in the safe stowage and shipment of solid bulk cargoes, excluding grain. The International Maritime Solid Bulk Cargoes Code (IMSBC Code), and amendments to SOLAS chapter VI to make the Code mandatory, were adopted by the Maritime Safety Committee (MSC), 85th session, in 2008. . The amendments entered into force on 1 January 2011. The IMSBC Code replaced the Code of Safe Practice for Solid Bulk Cargoes (BC Code), which was first adopted as a recommendatory code in 1965 . To describe test procedure to determine various characteristics of bulk cargoes. Group A consist of the cargoes which may liquefy if shipped with moisture content in excess of their transportable moisture limit. Group B consists of cargoes which possess a chemical hazard which could give rise to a dangerous situation on a ship. Group C consists of cargoes which are not liable to liquefy (Group A) and do not possess chemical hazards (Group B). Solid bulk cargo means any cargo, other than liquid or gas, consisting of a combination of particles, granules or any larger pieces of material generally uniform in composition, which is loaded directly into the cargo spaces of a ship without any intermediate form of containment. The carriage of solid bulk cargoes other than grain shall be in compliance with the relevant provisions of the IMSBC Code. Cargoes which may liquefy are cargoes which contain a certain proportion of fine particles and a certain amount of moisture. Such cargoes are designated as Group A under the IMSBC Code. Cargoes designated as Group C will not liquefy regardless of the moisture content, and are therefore not hazardous. In order to assess whether a given material may liquefy, Appendix 3 of the IMSBC Code specifies that any damp or wet cargo containing a proportion of fine particles should be tested for flow characteristics prior to loading. Cargoes can be tested using either the flow table method or the penetration test method, both of which involve increasing the moisture content of a sample until actual liquefaction is observed. For genuine Group C cargoes, this point is never reached and so no transportable moisture limit can be determined. As a result, any cargo which possesses a TML determined by either of these methods is a Group A cargo. However, it should be noted that some materials which are untestable by these tests may still liquefy, and as such are Group A cargoes. Similarly, any cargoes for which actual liquefaction occurs (for example by a flattening of the stow or large-scale cargo flow during ocean carriage) are Group A cargoes, independently of any tests carried out. On a practical level, Group A cargoes contain sufficient small particles that they can take on a muddy consistency if wet enough. Group C cargoes, by contrast, are gravel-like materials which never become muddy regardless of how wet they are, as any water added drains through the gaps between the particles. Simple qualitative tests to assess this can be carried out on the spot by taking a cargo sample and adding water to it to see if it turns into a mud-like consistency. If yes, the material is likely to be a Group A cargo. Table of Contents of IMSBC code. Cargo information shall be confirmed in writing and by appropriate shipping documents prior to loading. Any other information required by national authorities. What does the code MOLU 2210 stands for as per container marking ? What is SSA ( Ship security assessment )?